The Electoral College and its procedure are established in the U.S. Constitution by Article II, Section 1, Clauses 2 and 4; and the Twelfth Amendment (which replaced Clause 3 after its ratification in 1804). 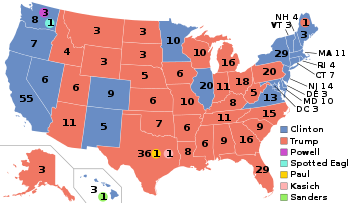 Under Clause 2, each of the states casts as many electoral votes as the total number of its Senators and Representatives in Congress, while, per the Twenty-third Amendment ratified in 1961, Washington, D.C. casts the same number of electoral votes as the least-represented state, which is three. Also under Clause 2, the manner for choosing electors is determined by each state legislature, not directly by the federal government. Many state legislatures previously selected their electors directly, but over time all of them switched to using the popular vote to help determine electors, which persists today. 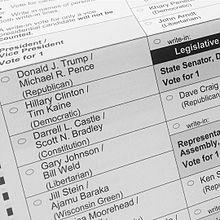 Once chosen, electors generally cast their electoral votes for the candidate who won the plurality in their state, but at least 21 states do not have provisions that specifically address this behavior; those who vote in opposition to the plurality are known as " faithless" or " unpledged electors". In modern times, faithless and unpledged electors have not affected the ultimate outcome of an election, so the results can generally be determined based on the state-by-state popular vote. Presidential elections occur quadrennially with registered voters casting their ballots on Election Day, which since 1845 has been the first Tuesday after November 1. This date coincides with the general elections of various other federal, state, and local races; since local governments are responsible for managing elections, these races typically all appear on one ballot. The Electoral College electors then formally cast their electoral votes on the first Monday after December 12 at their respective state capitals. Congress then certifies the results in early January, and the presidential term begins on Inauguration Day, which since the passage of the Twentieth Amendment has been set at January 20. Although not a mandatory requirement, Federal campaign finance laws including the Federal Election Campaign Act state that a candidate who intends to receive contributions aggregating in excess of $5,000 or make expenditures aggregating in excess of $5,000, among others, must first file a Statement of Candidacy with the Federal Election Commission. This has led presidential candidates, especially members from the two major political parties, to officially announce their intentions to run as early as the spring of the previous calendar year so they can start raising or spending the money needed for their nationwide campaign. Potential candidates usually form exploratory committees even earlier to determining the feasibility of them actually running. 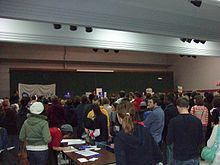 Along with delegates chosen during primaries and caucuses, state and U.S. territory delegations to both the Democratic and Republican party conventions also include "unpledged" delegates that have a vote. For Republicans, they consist of the three top party officials from each state and territory. Democrats have a more expansive group of unpledged delegates called " superdelegates", who are party leaders and elected officials. However, federal law does specify that all electors must be selected on the same day, which is "the first Tuesday after the first Monday in November," i.e., a Tuesday no earlier than November 2 and no later than November 8. Today, the states and the District of Columbia each conduct their own popular elections on Election Day to help determine their respective slate of electors. Thus, the presidential election is really an amalgamation of separate and simultaneous state elections instead of a single national election run by the federal government. Each state's winning slate of electors then meets at their respective state's capital on the first Monday after the second Wednesday in December to cast their electoral votes on separate ballots for President and Vice President. Although Electoral College members can technically vote for anyone under the U.S. Constitution, 24 states have laws to punish faithless electors,  those who do not cast their electoral votes for the person whom they have pledged to elect. Unless there are faithless electors, disputes, or other controversies, the events in December and January mentioned above are largely a formality since the winner can be determined based on the state-by-state popular vote results. Between the general election and Inauguration Day, this apparent winner is referred to as the " President-elect" (unless it is a sitting President that has won re-election). Among the 44 persons who have served as president, only Donald Trump had never held a position in either government or the military prior to taking office. The only previous experience that Zachary Taylor, Ulysses S. Grant, and Dwight D. Eisenhower had was in the military. Herbert Hoover previously served as the Secretary of Commerce. Everyone else served in elected public office before becoming president, such as being Vice President, a member of the United States Congress, or a state or territorial governor. Fourteen Presidents also served as vice president. However, only John Adams ( 1796), Thomas Jefferson ( 1800), Martin Van Buren ( 1836), Richard Nixon ( 1968) and George H. W. Bush ( 1988) began their first term after winning an election. The remaining nine began their first term as president according to the presidential line of succession after the intra-term death or resignation of their predecessor. Of these, Theodore Roosevelt, Calvin Coolidge, Harry S. Truman, and Lyndon B. Johnson were subsequently elected to a full term of their own, while John Tyler, Millard Fillmore, Andrew Johnson, Chester A. Arthur, and Gerald Ford were not. Ford's accession to the presidency is unique in American history in that he became vice president through the process prescribed by the Twenty-fifth Amendment rather than by winning an election, thus making him the only U.S. president to not have been elected to either office. Sixteen presidents had previously served in the U.S. Senate, including four of the five who served between 1945 and 1974. However, only three were incumbent senators at the time they were elected president ( Warren G. Harding in 1920, John F. Kennedy in 1960, and Barack Obama in 2008). Eighteen presidents had earlier served in the House of Representatives. However, only one was a sitting representative when elected to presidency ( James A. Garfield in 1880). Four of the last seven presidents ( Jimmy Carter, Ronald Reagan, Bill Clinton and George W. Bush) have been governors of a state. Geographically, these presidents were from either very large states (Reagan from California, Bush from Texas) or from a state south of the Mason–Dixon line and east of Texas (Carter from Georgia, Clinton from Arkansas). In all, sixteen presidents have been former governors, including seven who were incumbent governors at the time of their election to the presidency. The most common job experience, occupation or profession of U.S. presidents has been lawyer;  26 presidents had served as attorneys. Twenty-two presidents were also in the military. Eight presidents had served as Cabinet Secretaries, with five of the six Presidents who served between 1801 and 1841 having held the office of U.S. Secretary of State. Advances in technology and media have also affected presidential campaigns. The invention of both radio and television have given way to the reliance of national political advertisements across those methods of communication. National advertisements such as Lyndon B. Johnson's 1964 commercial " Daisy", Ronald Reagan's 1984 commercial " Morning in America", and George H. W. Bush's 1988 commercial " Revolving Door" became major factors in those respective elections. In 1992, George H. W. Bush's promise of " Read my lips: no new taxes" was extensively used in the commercials of Bill Clinton and Bush's other opponents with significant effect during the campaign. Critics also argue that the Electoral College is archaic and inherently undemocratic. With all states, except Maine and Nebraska, using a winner-take-all system, both the Democratic and the Republican candidates are almost certain to win all the electoral votes from those states whose residents predominantly vote for the Democratic Party or the Republican Party, respectively. This encourages presidential candidates to focus exponentially more time, money, and energy campaigning in a few so-called " swing states", states in which no single candidate or party has overwhelming support. Such swing states like Ohio are inundated with campaign visits, saturation television advertising, get-out-the-vote efforts by party organizers, and debates. Meanwhile, candidates and political parties have no incentive to mount nationwide campaign efforts, or work to increase voter turnout, in predominately Democratic Party "safe states" like California or predominately Republican Party "safe states" like Texas. In practice, the winner-take-all system also both reinforces the country's two-party system and decreases the importance of third and minor political parties. Furthermore, a candidate can win the electoral vote without securing the greatest amount of the national popular vote, such as during the 1824, 1876, 1888, 2000 and 2016 elections. In theory, it is possible to secure the necessary 270 electoral votes from only the eleven most populous states and then ignore the rest of the country. ^ Dixon, Robert G., Jr. (1950). "Electoral College Procedure". The Western Political Quarterly. 3 (2). doi: 10.2307/443484. JSTOR 443484. ^ a b c d e Pollard, Timothy D.; Chesebro, James W.; Studinski, David Paul (2009). "The Role of the Internet in Presidential Campaigns". Communications Studies. 60 (5): 574–88. doi: 10.1080/10510970903260418. ^ a b Endres, Warnick (2004). "Text-based Interactivity in Candidate Campaign Web Sites: A case Study from the 2002 Elections". Western Journal of Communication. 68 (3): 322–42. doi: 10.1080/10570310409374804. ^ Melcher, James P., " Electing to Reform: Maine and the District Plan for Selection of Presidential Electors", 2004, New England Political Science Association. viewed October 23, 2014.